This is our guide to identifying the enemy. If you're certain you have bed bugs, read our guide to the household equivalent of waging nuclear war to kill bed bugs. My roommate Dan confirmed our suspicions of a bed bug infestation earlier that week, communicated to me in a series of frantic texts filled with F-bombs and existential dread. His arms were covered in bites. His bedding was dotted with dark, dried spots of blood. He’d seen them crawl, slowly and inexorably, on his sheets. His mattress was our apartment's ground zero, which is why when I asked him about it, he replied with a single text: "Kill it with fire." Neither I nor Dan had a clear idea of what bed bugs really looked like or how they behaved before they invaded our home. If we had, we might have prevented them, or at least reacted with cooler heads. 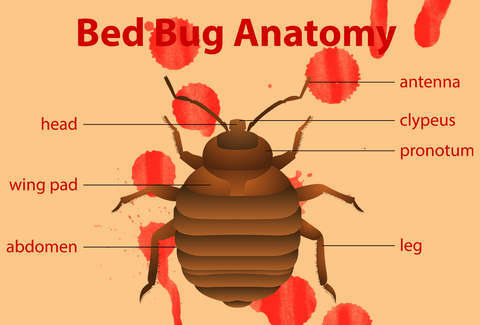 In the interest of helping others get through this unforgettable and often life-altering experience, here are a few basic facts about bed bugs unsuspecting victims should know before they look under the mattress. I wish I did. Bed bugs are flat, round insects with a segmented exoskeleton, not unlike an armadillo. They can climb up walls and on ceilings, flatten their bodies to crawl through cracks and the seams of mattresses, and grow to be no bigger than an apple seed or the head of a pin. These vermin reproduce via traumatic insemination -- which is a fancy way of saying they proliferate through sexual assault -- by penetrating the female's outer shell and inserting sperm directly inside. The females lay tiny pinhead-sized eggs in your mattress or in tiny dark cracks where it's warm and safe. A single female bug is capable of delivering up to 200-250 eggs in her lifespan. In six to 10 days, those eggs hatch and your problems multiply exponentially. You won't feel bed bugs crawl on your skin or bite you, because they inject you with a numbing, anti-clotting saliva before they start to feed. It takes them just three to 10 minutes to complete a feeding cycle on your flesh, and they only need one blood meal before they shed their skin and grow into their next stage of life. That means if you wake up covered in bed bug bites, it's important to act quickly. That's right. Bed bugs can mutate to adapt to extreme conditions. Like Colossus from the X-Men they can thicken their exoskeletons to stop toxicants from entering their systems. Like Wolverine, they have their own version of a healing factor, using enzymes to flush their systems and neutralize pesticides. "And this is one of the reasons why they're so difficult to control," says Paul Curtis of Terminix, an extermination service. What's more, they might even get off on it: "They can actually change their bodies to make pesticides not only less effective on them, but they can sometimes even be excited by pesticides instead of controlled by them." Leaving your house for a while to starve them out won't really work either. "Bed bugs can actually survive for a long time without food," says Tom King, field inspector for M&M Environmental, recalling a major extermination he had done in a large New York City apartment and surrounding units. "Probably 10,000 bed bugs got into the walls," King says. "A year later, one of them found a way out because of the caulking and sealing." The real joke is that they were mostly thought to have been wiped out in the '50s, to the point where even entomologists learning about the vermin 20 or 30 years ago were trained to think of them as a problem of the past. "At that point bed bugs were not an issue," says Ron Harrison, a pest control expert with Orkin. "In graduate school we were shown vials of bed bugs but told we wouldn't need to worry about them." It was only in the '90s that they began to re-emerge from the shadows, like Sauron in the beginning of Lord of the Rings, and we don't know exactly why. "Oh, that's standard. 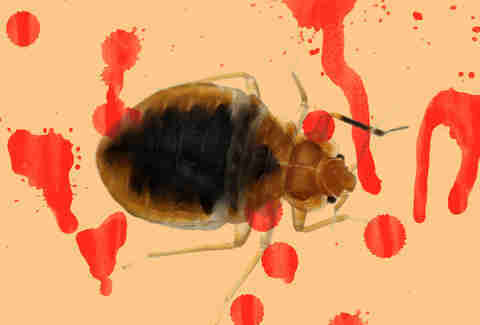 That's daily," King says when asked about the psychological toll bed bugs take on their victims. A writer at The Atlantic called it "bed bug PTSD" a couple years back, pointing at the awful case of a woman suffering from bipolar disorder whose bed bug infestation drove her to commit suicide. "Our customer service team, they're part technical support and part counselor," King adds. "We have clients that cry on a daily basis." You need only look at some online comment threads to understand how emotionally damaging bed bug infestation can be. It’s completely normal to experience anxiety, lack of sleep, and paranoia when bed bugs invade. That's why you have to do something about it as soon as possible if you have them. For more information, please read our full guide to killing bed bugs. Do not wait. Eric Vilas-Boas suffers from the bed bug PTSD and can spot one from several yards away at this point. Follow him @e_vb_.